Behati Prinsloo’s engagement ring from husband Adam Levine is an incredible piece of vintage jewelry that dates back to the 1930s. With a round center diamond supported by four prongs, it features delicate scrollwork on the band. Like Behati Prinsloo’s engagement ring, this stunning design from Brilliance features an intricate setting that showcases the diamond beautifully. The gallery is elevated to allow for maximum sparkle, and the scrolled design adds an incredible amount of interest to the ring. This particular ring is made of white gold, but it looks equally stunning in platinum, palladium, or yellow gold. Born in Grootfontein, Namibia, Behati Prinsloo is the daughter of a church minister, Boet, and bed and breakfast owner, Magda. She grew up speaking Afrikaans but was educated in English. Discovered at the age of 16 while on holiday in Cape Town, Prinsloo has enjoyed an incredible career as a supermodel, walking in fashion shows for top designers including Chanel, Prada, MaxMara, Louis Vuitton, Zac Posen, Lacost, and Miu Miu. She has graced the covers of Mexican GQ, Vogue, Elle, and American Velvet, along with a number of other American and international magazines. Behati is perhaps most famous for her work as a Victoria’s Secret model. She made appearances in the Victoria’s Secret Fashion Show each year from 2007 to 2013, and in 2009, she was made a Victoria’s Secret Angel. She has continued doing pront work for the company over the years, starring as the face of the sub-brand Pink. In 2014, Prinsloo opened the Victoria’s Secret show for the first time. Ranking 12th on the models.com list of Top Sexiest Models, she is also the face of the Pepe Jeans campaign for spring and summer of 2014. She has enjoyed minor acting parts, however her main focus is on modeling. Did you know that Behati Prinsloo is such a successful model that she has made cameo appearances in TV shows and music videos as herself? In 2012, she had a part in the show Hawaii Five-0. In 2009, she appeared in The Virgins music video “Rich Girls,” and in 2014, she had a part in “Animals” by Maroon 5. Behati began dating Maroon 5 front man Adam Levine in 2012. The two announced their engagement in July of 2013 after Adam proposed on bended knee. The happy couple was married in Mexico on July 19th of 2014. What Our Experts Have to Say about Behati Prinsloo’s Engagement Ring. Classic, romantic, and incredibly beautiful, Behati Prinsloo’s engagement ring is quite a bit smaller than the average piece of Hollywood jewelry, but don’t let that fool you into thinking it is not very, very special. This vintage engagement ring is one of a kind, dating back to the 1930s. The center diamond appears to be a little larger than a carat, although its exact weight has not been confirmed. Celebrity engagement rings like Behati Prinsloo’s are very special, however that doesn’t mean that beautiful, classic engagement rings are for Hollywood stars alone! You can get the look of a true vintage ring without the exorbitant price tag by working with Brilliance’s online design tools and friendly consultants to create a look that gives a nod to Behati’s ring while incorporating special elements that are important to you – and while sticking to a budget that works realistically within your life. 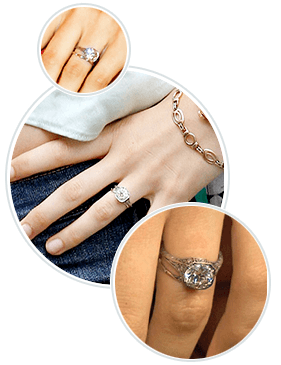 Your engagement ring should be special and noteworthy, and with Brilliance by your side, you’ll discover that adding special sparkle to your love and life is surprisingly simple.